It can be hard finding a place to escape from the bustle and stress of university life, but luckily there are places like Orienthé for just that. 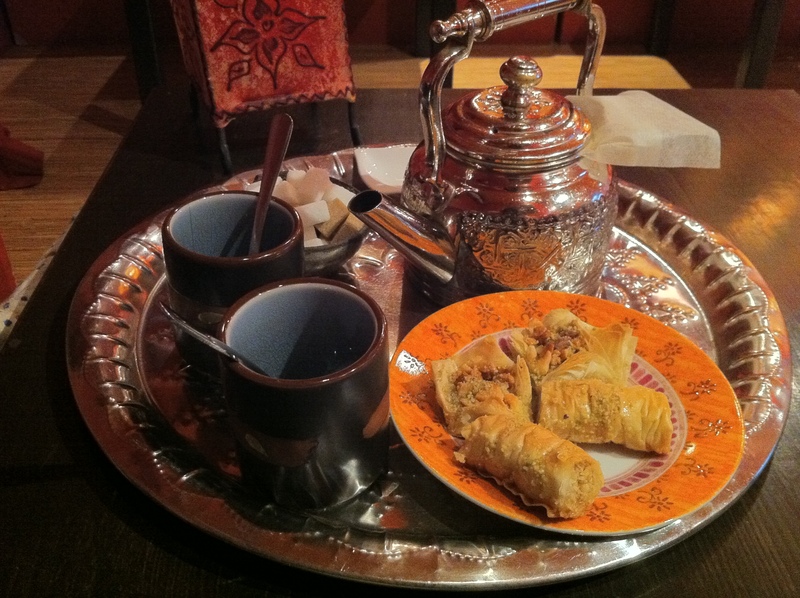 This Moroccan-style tea and shisha lounge will instantly bring down the midterm blood pressure. course). Decorated all in warm reds and golds with Oriental statues and paraphernalia on the walls, it feels like a sunny, exotic escape. There are cushions and low couches lining the walls and a quaint collection of books leaning on the shelf by the window for clients to peruse. In the back is a luxurious alcove with pillows on the ground and sheer curtains, a space ideal for private get-togethers. The menu offers a wide range of teas, from black to green to red. It’s perhaps not the best place for someone living on a budget, the average price being $4.50 for a personal pot, or $8 for a large pot for two. The combos, however, are where the savings kick in. For two friends wanting a nice place to chill for the evening, it’s possible to get a hookah, four pieces of baklava, and either two personal teas or a large pot for two for $24. To contrast, the hookah alone would cost $13. Light meals of homemade quiches, soups, and sandwiches are also offered. The service was quick, and while maybe not overtly friendly, not notably dismissive either. They do not hover, which adds to the feeling that this is a place to stay and relax rather than be rushed out of. That being said, because they aren’t waiting on you, you’ll have to go to the counter if you want to order anything else. The tea was quite good. Perhaps it’s not as fancy as a traditional teahouse with pouring rituals, but to an average tea appreciator, it satisfies the need for steeped, comforting goodness. The baklava was fresh, flakey, crispy and sticky with honey. It’s not the kind of baklava you’d find in plastic grocery store boxes or in take-out restaurants where it’s been left to grow stale and chewy. As for the shisha, it was excellent and perhaps the best part. It turns Orienthé from an average tea lounge into a place worth remembering. Compared to other shisha lounges the price is quite comparable, and might even be less expensive. Personal mouthpieces are provided to each customer, keeping things germ-free. Over the course of a three-hour afternoon stay, there were only about ten clients who stopped by. Rather than feeling empty it felt comfortably quiet; it wouldn’t be nearly so enjoyable if it were hopping with business. As such it becomes the perfect place to chat with friends, bring homework, catch up on some reading or write an article. Orienthé is located on 4511 St-Denis St.